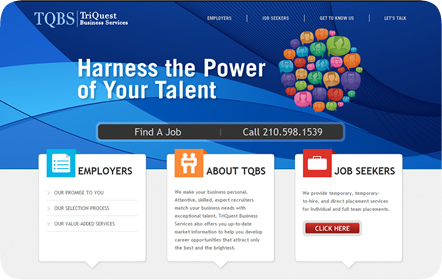 TriQuest Business Services, established 2009 in San Antonio, knows plenty when it comes to recruitment. With 30 years of collective experience within the company, TriQuest consistently delivers the best possible services to both employers and job seekers in the United States. 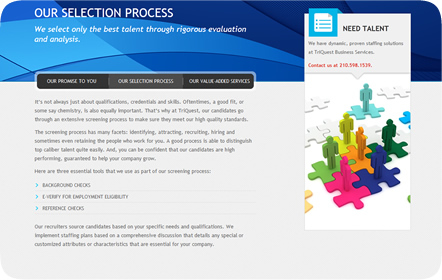 This includes matching businesses with the perfect talent and providing the latest market information. Their current client list includes several Fortune 500 companies involved in financial services, entertainment, healthcare, and retail, just to name a few. 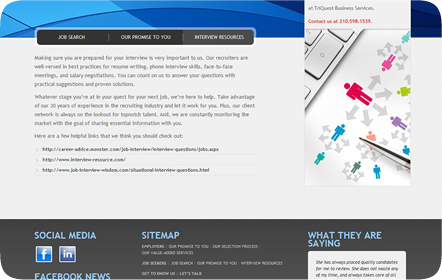 TriQuest’s former website lacked the heart and the culture of the company. What they needed was a new website that incorporated a fun yet professional environment. 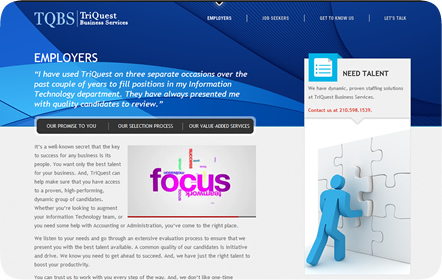 Using bright shades of blue, we made TriQuest look like a place that knows and understands the younger audience looking for a new job. Employers were kept in mind by including information about their services and rigorous screening process in a clean presentation.